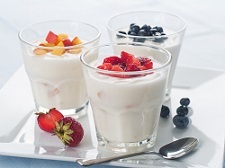 This makes a great breakfast, afternoon snack or even a dessert. It is packed with vitamins and protein. A delicious topping for meats, poultry, fish and breads. A light version of strawberry shortcake. 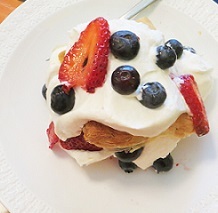 The delicate puff pastry is so refreshing and the mascarpone lends a wonderful flavor to the whipped cream. Delicious! Delicious barbecued salmon topped with a blueberry reduction sauce. 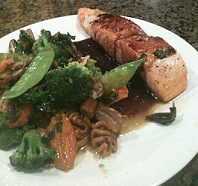 A surprising and tasty way to serve salmon. 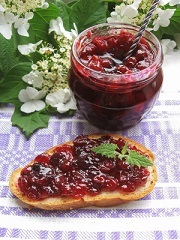 A delicious jam combining fruit and vegetable. See if your guests can guess the ingredients! For a fresh tasting, light fruit dessert, try our grilled apricots topped with mascarpone, ricotta and basil, with a sweetened sherry vinegar sauce. For a refreshing side dish to accompany your favorite fish, poultry, or meat entrée, try our papaya-pineapple salsa......so good! Perfect for a barbecue. What a refreshing, light dessert this is! Apricot flavored tart is the perfect end to a special meal. With year-round fruit available now, this wonderful almond-chocolate flavored peach dessert can be enjoyed in any season. Great after a filling meal. Ready for some spicy hot bananas? This recipe will produce a wonderfully hot version that you won't soon forget!! An easy baked pear dish, suitable as a salad or dessert. 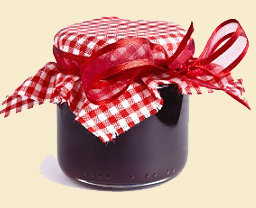 Delicious red cabbage dish, sweetened with Wild Blueberry Balsamic Condimento, dried apricots, and apricot preserves. Great with Brats or Sauerbraten.